Weight adjusters: You can now assign individual weights to heavier items in a family without having to provide a weight for each item in the family in the assigned family weight. Order sync: Add Order sync option for “Modified Since Last Sync” to address an issue with retrieving orders that convert from abandoned carts. Intelligent product re-linking: We’ve added code to re-link StorePorter products to products accidentally deleted, then re-created in the back office… less worry and work for you! StorePorter is the dynamic eCommerce software solution that’s always working so you don’t have to be. With regular updates, additions, and fixes, we offer our customers the most timely solutions to meet their webstore needs. Our automated system keeps you free to manage customers and build your business without the time and cost-consuming manual processes that slow down your success. Check out how StorePorter can address your eCommerce store needs by scheduling a free demo today. If you’re in retail, you already know that eCommerce just keeps growing — and growing, and growing! The rise of online shopping has caused concern among brick-and-mortar retailers who worry that their stores might soon become obsolete. At the same time, webstore owners are beginning to realize the importance of a physical presence in aiding shoppers along the decision-making process. With all this talk of online versus brick-and-mortar, what’s a savvy online retailer to do? At StorePorter, we know that this isn’t a “one or the other” scenario. With some simple strategies, you can combine the best of both worlds — the customer service of in-store and the ease of online shopping — to help your business thrive. Here’s how using multiple channels can help your retail business succeed. Predictions show that by 2020, 75% of businesses will be digitized. But despite warring numbers between the eCommerce store and physical storefront, the two channels can unite to create a powerhouse. Case studies have shown that retail and online stores that bridge the channel gap see increased sales. Stores, chains and restaurants like Amazon, Dicks Sporting Goods, 3M, and Taco Bell have incorporated multi-channel marketing into their strategy, and experienced a boom in sales. When working together, your eCommerce store can significantly boost your sales goals by drawing in the e-crowd. The same is true of your brick-and-mortar. Customer service is the thing that many digital stores lack, and the thing that often drives potential customers back to physical storefronts. But no matter the channel, high-quality service is key. Attend to your customers, and you’ve won their loyalty. Leave them lost in an online world of categories, text, and ambiguous sizing charts, and they may just ditch the deals for some personalized in-store shopping. Provide visitors with a seamless online shopping experience with excellent customer service This creates the incentive for customers to visit your eCommerce store again. Whether online or offline, get good at customer service. Shopping is a social experience, and a favorite pastime for youth and adults alike, according to a Nielsen report. Reach your social shoppers by providing options for in-store and online experiences. By offering a 24/7 shopping experience, you can encourage your online customers to plan and personalize purchases before ever stepping foot into your physical store. If you’re looking to give your brick-and-mortar an upgrade, consider looking to concept stores like Apple, which blend the physical with the digital world. And remember, when it’s all said and done, a few things will cause both the eCommerce store and physical store to fail: poor customer service, lack of innovation, decreased productivity, and failure to improve concepts and products. If you’re entertaining the idea of growing your brick-and-mortar or your eCommerce store by expanding into another channel, StorePorter can help you create a seamless user experiences. StorePorter helps businesses sync their inventory and set product thresholds between physical and online stores so that their efforts support one another and build a stronger whole. With StorePorter’s innovative software, it’s easier than ever to expand your online store into the physical world, connect your POS system with your webstore, and ensure that the entire shopping experience is smooth sailing. Schedule a free demo to check out how we can help grow your business in just a few clicks. 2015 was a great year for StorePorter. We expanded our team (if you haven’t already read our interview with Patrick, check it out here), made major updates to our software, and connected with more AcuSport retailers than ever before. Now, we’re kicking off 2016 in a big way: by showcasing our eCommerce software this January at the AcuSport Business Conference (ABC) in Fort Worth, Texas. Our entire team is excited about ABC 2016, and for good reason: it’s a huge gathering of independent firearm retailers and savvy business owners who want to learn how to do business right with their AcuSport software. These are our kind of people. Through a variety of cutting-edge panel discussions, lectures, and workshops, ABC gives retailers all the tools they need to bring their businesses to the next level. At StorePorter, we’re passionate about helping you use AcuSport to manage your inventory and boost your online sales. StorePorter is proud to be exhibiting at an ABC booth with AcuSport Retail Technology Group (RTG), producers of two great solutions for firearms retailers: V6 and Axis. With StorePorter and RTG in your eCommerce toolbox, you can optimize your business on every front and rest assured that your brick and mortar and eCommerce operations work together seamlessly. If you’re attending ABC from Jan. 24-27, be sure to stop by and say hello to our CEO, Dan, and our lead Application Developer, Patrick. We’re looking forward to learning about your eCommerce needs, what eCommerce success means to you, and how our team can help you get there. See you in Fort Worth! With the New Year quickly approaching, we’re tapping into our Auld Lang Syne spirit and reflecting on the eCommerce trends that shaped 2015. But don’t brush these off as bygone fads. 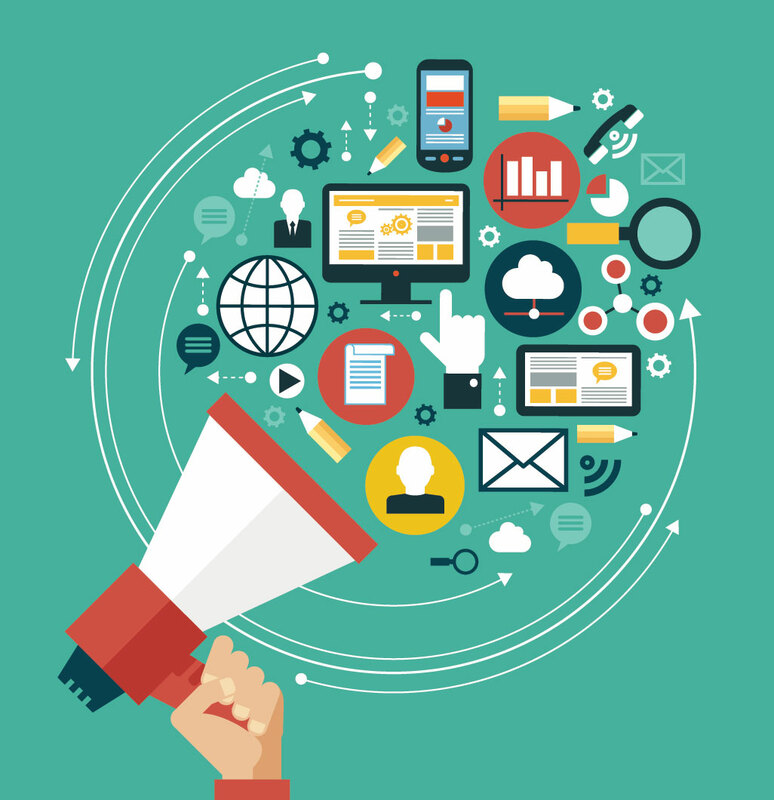 The advancements that shaped 2015 will continue to drive growth and innovation in online marketing for years to come. Whether you’ve already set your webstore strategy for 2016 or are in the midst of carving out your plan, employ these five tips to outsmart your competition and give shoppers the high-quality experience they crave. One of the notable eCommerce trends of 2015 saw many online stores opening physical locations to broaden their market and reach. In the U.S., 90% of sales are still made in brick and mortar stores, and 95% of consumers prefer shopping from online stores that have a physical presence. For many, the in-store product experience and customer service enhances the brand experience and builds greater trust. In an attempt to obliterate the difference between their online and physical stores, many innovative companies are bridging the gap by shipping customers several options of a product to compare, offering free shipping to their stores, and increasingly, free return shipping as they merge the convenience of online shopping with the customer in-store experience. At StorePorter, we understand the importance of your brick and mortar presence. Whether you’re just launching your business’ first online store or are ready to open a physical location for your booming webstore business, our gurus can help you ensure your inventory and product details are seamlessly synched. Visual content has consistently proven to be a reliable marketing technique and conversion tool. The brain processes images 60,000 times faster than text, and increases the time that a customer spends on your website. Video marketing has increased by 73%. High-quality images and engaging and useful video content consistently generate higher conversion rates. And with StorePorter, you can deploy videos and photos of your products more efficiently than ever before. Millennials and baby boomers are the driving force behind today’s eCommerce marketing decisions. Successful online retailers used customer data and habits to connect them to a more personalized shopping experience. Providing suggestions or histories on similar customer purchases can go a long way in generating trust and building relationships and loyalty. Given the impact of big data on the 2015 eCommerce industry, this trend won’t be going anywhere in the coming years. Coupons are so 2014. While promotions still play an important role in eCommerce enticements, today’s savvy marketers are finding that they can attract customers organically through relevant, customized content. One of the major eCommerce trends of 2015 revealed that timely, relevant content is often the dividing line between gaining customers or losing them to a content marketing giant. Because useful content often drives sales and brand loyalty, webstores large and small are incorporating a variety of written, visual and video content into their product pages to enhance the customer experience. With StorePorter, you can manage product descriptions and other content with ease — leaving you more for content marketing and other business development projects. In 2016, don’t be content with sub-par content. 80% of consumers reported that the leading factor in the decision to follow a brand was authentic content. In fact, 57% of a decision is made prior to ever talking to a salesperson or visiting a store. If that’s not a sign of content marketing’s staying power, we don’t know what is. 2015 was the year of Mobilegeddon, and 12 months later, mobile commerce (mCommerce) isn’t going anywhere. In just two years, eCommerce sales via mobile increased by 175%, and this figure continues to soar. Mobile commerce accounts for 30% of U.S. eCommerce, and to date, 98.9 million Americans have made at least one purchase over a mobile device. Not surprisingly, savvy ecommerce retailers are focusing their efforts on optimizing sites for a range of mobile devices, and simplifying the mobile shopping experience to convert more browsers to customers. Apps and mobile loyalty programs are additional ways to drive customer engagement and decisions. This eCommerce outgrowth is on its way to behemoth status. If you haven’t already embraced mobile shopping, 2016 is the time to take a step into this increasingly crucial webstore territory. Now is the time to position your webstore for a dynamic 2016. Whether you want to create a seamless inventory experience between your brick and mortar and online store, or are looking to deploy product content more efficiently, StorePorter is your ultimate eCommerce software solution. Our eCommerce gurus will help you leverage your strengths, streamline your inventory, and bridge the great divide between online and brick and mortar sales — positioning you for your most successful year to date. If you’ve been searching the eCommerce and inventory software worlds for the next big thing that will do more than simply offer inventory management, whether by destiny or chance, you’ve happened upon the right place. eCommerce software from StorePorter can ease transitions to help you get results, improve and automate processes, and eliminate the manual steps it takes to get your products online – all while managing your inventory in the most efficient way. It’s web store genius. But don’t take our word for it. We prefer to let our product speak for itself, and know that you’ll love it as much as we do. At the end of the day, it’s not about selling some eCommerce software. It’s about providing business owners with the tools they need to help them manage a successful online business. That’s why we offer a free, no-obligation demo of StorePorter’s eCommerce software. Be warned: StorePorter demos are not passive, snooze-inducing experiences. During our demo, you’ll be engaged in the process as you learn about the capabilities, applications, and exciting features that this software offers to get you the results your business needs and eCommerce success. And did we mention that you’ll also have the opportunity to get insightful, brilliant answers to all your burning questions about eCommerce, and eCommerce software? Our team of eCommerce experts will provide insights into the e-business world, and demonstrate how StorePorter bridges the gap between traditional inventory software and the future of your business through innovative features and integrations. So whether you’re just starting out or are a seasoned web store pro, StorePorter will help you navigate the eCommerce world and keep you ahead of the game. Consider it more than a demo. Consider it a free investment for your business success. Sign up for your StorePorter test drive today! StorePorter is growing, and we’re excited to welcome our newest Application Developer and CS genius, Patrick. Here’s a glimpse into the mind of one of our behind-the-scenes tech gurus. How did you first hear about StorePorter’s software? I first heard about it about 9 years ago, when Dan first started creating the software. Dan and I had been hired at the same company in 1989, and worked together for years. When he said his next project would be a web interface that simplified the inventory management system for brick and mortar stores that were developing an online presence, I acted as his sounding board. Even then, I knew he was onto something. What experience and skills do you bring to the StorePorter family? I’ve been involved in some form of programming for the last 3 decades. I also have 2 decades of experience in retail and IT, as well as proficiency in GIS. The transition to StorePorter has been pretty smooth. It’s a natural fit and progression from what I was doing. The common thread that ties all my experiences together is my desire to work diligently until a problem is resolved. What excites you most about StorePorter and your new role? I’m very excited about the new channels we will be developing for eBay and Amazon Marketplace. The StorePorter solution for what has been a very manual process of listing individual items on each channel will really simplify selling products across the web. In my current role, I get the best of both worlds in development and customer support. Helping fix customer problems exposes how things work underneath, and it’s the best way to become proficient in the back-end of the software. Working in support and development results in a more stable product for our clients. Apart from your enthusiasm for the big developments on the horizon, what excites you most about life? I have many hobbies, but I love volunteering and doing charitable work. I’m a member of the Knights of Columbus, and a member of the Geneva Emergency Management Agency (GEMA). We’re the guys who do traffic and parking duty. I try to be a part of my community and volunteer locally. I’ve served with the Knights for more than a decade. The thing that made me passionate about it was seeing their fundraising efforts on street corners. I wanted to be the happy guy putting that dollar in the bucket instead of the grumpy guy who won’t even look at you. But the most wonderful part of my life by far is my wife of 30 years and 3 grown children. When I’m not working or volunteering, I enjoy just being with them. To our clients who have the pleasure of working with Patrick, feel free to give him a big hello, and know that your technical questions are in capable hands. This month, Entrepreneur said that one of the five most important ways to ensure your eCommerce business’ success is to choose the right eCommerce software. We couldn’t agree more. Here’s why StorePorter is the best eCommerce software for your inventory and product management needs. Entrepreneur lists solid conversion and marketing tools as imperative to a good eStore software — and we couldn’t agree more. Your business’ eCommerce software needs to be more than a simple inventory management system. Having the necessary tools at your fingertips can help improve your business by providing the technology to automate tedious processes. That’s why StorePorter is packed with important tools for your trade, like Product Threshold, which helps set limits on the number of each item that you sell online, reserving stock for your walk-in trade. The Product Families tool consolidates your variation inventory into a single webstore listing. The variety of tools that StorePorter offers will help maximize your customer’s user experience, and make your online store finally work for you. StorePorter also offers on-call tech and business gurus to help empower you to take your eCommerce store to new heights. StorePorter’s user-focused eCommerce software makes it the simple, efficient choice for Bigcommerce retailers taking their store online. With a unique combination of quantity updates, order management, content creation, image management and automated tools to simplify your daily routines, StorePorter provides more accurate inventory counts, ongoing support, and the freedom to spend more time growing your business rather than trying to develop, sync, and manage your e-presence. We work hard behind the scenes to keep it smart and simple for you. Want to learn more about how StorePorter can save you time, money and costly inventory errors? Schedule a call with our webstore geniuses today. If you’re anything like us, you’ve experienced a scenario like this: You have tons of products to add to your Bigcommerce store, many of which need identical text in their product descriptions. After copying and pasting — and then, reformatting — the text from a Word document about 50 times, you start wondering to yourself, Is this really the most efficient strategy? Then, a few minutes later, you find a typo in the text you’ve been copying and pasting into your products. Frustration ensues. StorePorter’s Text Templating Tool is the antidote to endless copying, pasting and fixing typos. Busy merchants love this unique feature — available exclusively from StorePorter — because it dramatically cuts down the time and effort needed to draft product descriptions, creating a much more efficient, and less frustrating, business process. Here’s how our Text Templating Tool works. StorePorter created the Text Templating Tool with a simple concept in mind: make it easier to add, and customize, product descriptions in your eCommerce store. With this tool, you can quickly develop a template that ports over copy for all products that apply. Our rich text editor allows you to apply styles and customize format in a number of ways that remain consistent across all products using this template. Say goodbye to the hassle of re-formatting text pasted from Word, and re-entering identical information across multiple products. This time-saving, stress-relieving tool streamlines your process in just a few clicks. Product subsections: Bigcommerce only has a single field for product descriptions. With this tool, you can add subsections based on your business’ unique needs. Many of our customers add a secondary header for specifications information within their product description, and others use this tool to add special shipping or manufacturer details for particular collections. Template updates: Remember that typo you found after you copied and pasted a description 15 times? You no longer have to correct each individual product. With the Text Templating Tool, simply update your template, sync your software and — like magic! — all products using that template are updated. Rich text editor: Customize your template using our advanced text editor, which allows you to select styles and other text customizations that will be applied consistently for each product using the template. At StorePorter, we’re not just software gurus; we’re also online retailers who know what tasks cost you time and money. Tools such as our Text Template streamline your webstore management so that you can get back to growing your business. Contact our friendly staff today for a demo of this and other powerful StorePorter automations. eCommerce might not be a new concept in the digital realm — but it’s rapidly becoming one of the most innovative and competitive segments of the technology world. With so many eCommerce stores and payment platforms on the scene, today’s eCommerce sellers need to make sure they stand out from the crowd. With an industry growth in the billions of dollars over the last several years, now is one of the best times to launch your eCommerce business. Whether you’re a seasoned seller, the new kid on the block, or a bright-eyed entrepreneur, these eCommerce tips can ensure growth and success for your online store at any stage. Curb your enthusiasm and don’t rush launching your website. Make sure that all the important elements, including your product descriptions, are correct, and that the site works properly. You don’t want your customer’s first experience with your store to be negative. Use StorePorter to automate your content management to make sure your user experience is positive and impressive. eCommerce, for all its conveniences , can offer some serious drawbacks — such as eliminating the customer’s ability to physically handle an item prior to making a purchase decision. That is why product images are so important. Use StorePorter for your product image management and your webstore will reflect that you keep the user in mind, and are focused on making their shopping experience as uncomplicated as possible. By keeping your store simple and easy-to-use, customers will be much more likely to make additional purchases and recommend your store to friends. Test. Test. And Test Again. This is an imperative step in the pre and post-launch phases. Save room in your budget for testing and analytics. Put yourself in the mindset of the customer, and see what works, what’s faulty and what could be improved. Mobile sales are expected to increase from $204 billion in 2014 to $626 billion in 2018. Stay on top of cultural shifts, trends, and technology to ensure your site is optimized for mobile and tablet use. You never know how a potential customer might discover your site, so be prepared! If you want to be found by potential customers, you have to employ the tools to make it possible. SEO, or search engine optimization, is a marketing tactic that combines well-written, targeted content with your site’s position in online search results. Make sure your site copy and product descriptions contain relevant keywords and search terms that users might look for — but don’t overload your site with target phrases. You may not see the immediate payoff of your SEO efforts, but it will help you stay on the scene for the long run. Social media is your key to understanding your customers’ interests and spending habits. Staying involved with your business’s social media efforts will keep you informed and influence smart decisions down the road. Your site should feature prominent links to all of your business social media profiles. Draw potential customers to your social pages with “like” or “follow” buttons, and gain their trust by featuring product reviews and testimonials. Social engagement is an important step for converting browsers to buyers. In addition, be sure to add sharing buttons to all of your products. This allows your loyal customers to recommend your products to their network. Find out who your customers are. Make sure to keep a database of emails and other relevant information to build and nurture meaningful relationships with your customers. Check out how StorePorter can work with your developers to gather data efficiently and effectively. One key eCommerce tip: don’t fade into the past. Keep your technology, products and strategies aligned with the times and the global culture. If you want to stay poised for success, you must remember that the eCommerce world is one where evolution rules, and only those who adapt will survive. Using the automation process from StorePorter will help you deploy your new products faster than ever to keep you on trend with your customers. The eCommerce world can be a daunting one — but by following these proven eCommerce tips, you’ll be armed with the knowledge needed to push your business to the top of the crowded online shopping heap. And no matter your retail store’s stage of growth, be sure to reach out to StorePorter for eCommerce expertise and inventory management. Happy selling! Improved logging. The reason and context of Product and Family updates are now notated. Integration: For ARS/AcuSport back office integration, you can now choose to reflect in-store promotional sale prices in Bigcommerce. Filtering: Product and Family grids can now be filtered by category. Template Naming: You now have the ability to rename Text Templates. Existing references to the template will be properly updated in Products and Families. Linking: You now have the option to link your Text Templates to a Brand. This will restrict implementation of template to Products and Families of that brand. Unlinked templates will still be available in all Products and Families. Error handling: We’ve improved error handling stability so that StorePorter will no longer freeze and require a forced shutdown. Performance: We’ve dramatically improved the single record sync performance, making it easier to sync from the grid. Maintenance: You can now use sale price maintenance with Family Members. Hiding Prices: If product availability is set to “disabled,” our software will now support “hide price” and “hide price label” fields. Improvements: We’ve made numerous improvements to general stability and reliability. Preview: The Preview feature for Products and Families now uses an integrated viewer rather than the default browser. Duplicates: Our software now offers advance pre-sync feedback regarding duplicate names and SKUs. Rich text editor: We’ve implemented a new text editor. 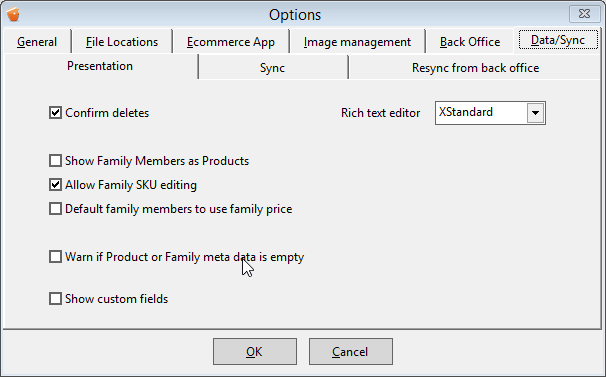 Access it by going to Tools>Options, selecting the Data/Sync tab, then choosing the Presentation subtab and setting “Rich text editor” to “XStandard: http://i.imgur.com/8svV9dD.png.” If you have more than 1,000 SKUs, please reach out to our support team before enabling this feature. eCommerce is dynamic and constantly evolving. Your eCommerce software should be, as well. At StorePorter, we’re continually updating our software to reflect the latest, and greatest, advancements in webstore automation and management. Check back often for updates, and if you aren’t a customer yet but want to take advantage of all our software has to offer, schedule a demo with us today.